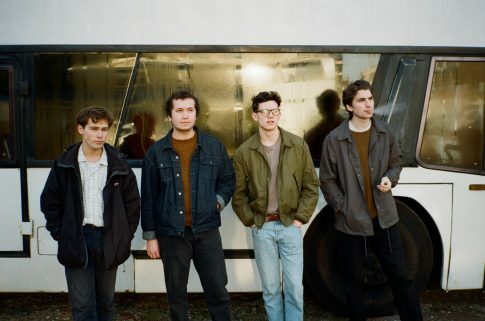 Two indie musicians who used to study at Brockenhurst College have shot to number one in the UK Vinyl Chart with the debut album from their band The Magic Gang. Brock alumni Jack Kaye and Chris Smith, who both play guitar and share vocal duties, joined forces with Paeris Giles and Angus Taylor to form the Brighton-based band at university. Their self-titled 12-track album, which includes recent singles How Can I Compete, Your Love and Alright, made it to number 12 in the overall UK Album Chart. Music magazine NME gave the record four stars, with reviewer Rhian Daly adding that the songs are ‘a timeless collection that packs in a ludicrous number of pop hooks”. A statement on the band’s Facebook page said they were ‘over the moon’ with the record’s success, adding: ‘Thank you all who bought the album, you’re all the best.”. There has been a considerable buzz about The Magic Gang on the UK music scene for months, especially in London and Brighton. Dork music magazine called them one of the most exciting bands around, and they have received regular airplay on BBC Radio 1. Jack and Chris now join the roll call of former Brock students who have achieved notable success in the music industry. The list includes Jamie Reynolds from Klaxons, Sarah Joyce aka Rumer, and James Davidson from drum and bass duo Ulterior Motive who produced Goldie’s latest album.